Sunset Air Conditioning & Heating specializes in the installation and replacement of residential air conditioners and heat pumps. We've installed over 15,000 air conditioning systems for homeowners in Naples, Marco Island, Fort Myers, Cape Coral, Bonita Springs, and surrounding areas. With our level of expertise and skill, residents throughout Southwest Florida can trust that they will get a high-quality air conditioning system correctly sized for their home that is expertly installed for optimal performance and energy efficiency--all for one great price. At Sunset Air Conditioning & Heating, Your Comfort Is Our #1 Priority! At Sunset Air Conditioning & Heating, we're dedicated to customer satisfaction. We have built our business around quality service, integrity, and and fair pricing. As a result, we have thousands of loyal customers who continuously refer their friends, family, and associates to us. Our clients know that they can come to us for expert advice, a great value, and excellent customer service. Sunset Air Conditioning & Heating is fully insured and holds a class-A state contractor's license. We have over 20 years of experience and a team that excels in installing and replacing air conditioners and heat pumps. 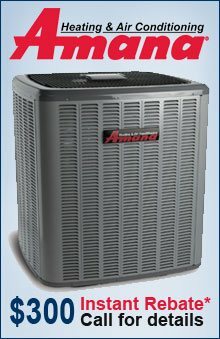 We service all major brands, but are an authorized dealer for Trane, Rheem, Goodman, Amana, and Daikin. By offering our local clients a diverse selection of quality, brand-name HVAC (heating, ventilation, and air conditioning) systems, we are able to give each customer a customized solution that specifically meets their heating and cooling needs and preferences as well as their budget. All our air conditioning brands come with limited parts warranties. Additionally, Sunset Air Conditioning & Heating backs its workmanship with a one-year labor warranty and the option to buy an extended warranty. At Sunset Air Conditioning, we have two locations to provide prompt, dedicated service to residents throughout Naples, Bonita Springs, Cape Coral, Fort Myers, Marco Island, and other cities in Collier and Lee Counties. If you live in or near any of these areas, call Sunset Air Conditioning & Heating, Inc. today. We offer free air conditioner installation consultations, and we can provide quotes over the phone or on site.